A great article about the show on InsideOut Cap Cod. They give a great review of the show. We have our final week starting Wednesday evening at 9pm. We have Frank DeCaro, Mimi Gonzalez, Jennie McNulty, and Joe MacDougall. Come out and enjoy! We are launching banner ads! The one above I created and went all old school animated Gif. 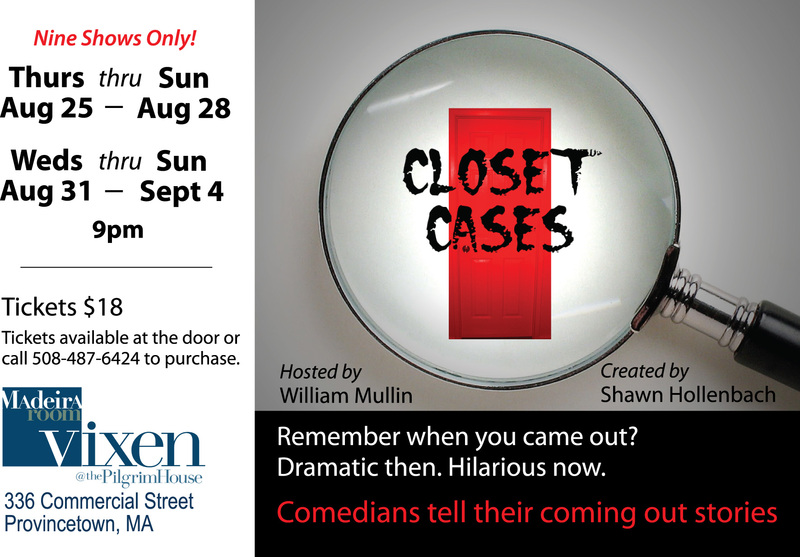 We begin Closet Cases on August 25th this Thursday! Come out and have fun. Begins at 9pm at The Vixen. 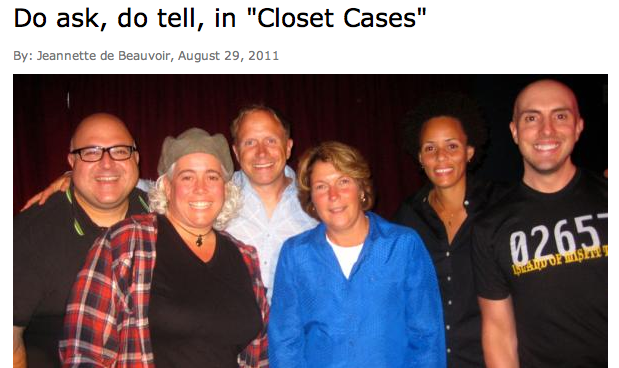 So I head up to Ptown this weekend to distribute these awesome postcards for Closet Cases. We have an amazing lineup this year. Which includes Frank DeCaro, Kevin Allison, Mimi Gonzalez, Poppy Champlin, and Jennie McNulty. 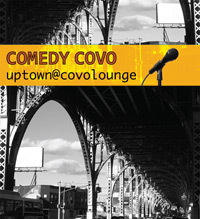 They are joined by other great comedians telling their coming out stories on stage. I host and produce this event, but the creator of the show is Shawn Hollenbach. How magical is Shawn? Find out. He will be in the lineup from August 25th-August 28th. You’ll see him on Commercial Street bouncing like a pixie handing out these wonderful cards with his amazing logo (last year it unofficially won Ptown’s best show logo award!). We are sponsored by Human Rights Campaign again this year, which gives a generous gift card to a member of the audience who wants to come up on stage and be interviewed by me about their coming out story. Fun for all! Hope to see you up there this year. Ahhh. 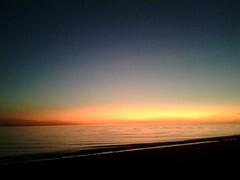 It is nice to unwind with a beautiful sunset in order to put things into persepective. The Pinhead (Guffman) and I sat and watched. We thought about the stressed out Lehman Brothers Brokers, but only for a second. These shots are from my cell phone – not too great but definitely does the job. I recently ate in the Mayflower Restaurant in Provincetown, which is a an old restaurant which has been around for years and serves mainly locals and cheap tourist who want a diner type of bite for dinner. Old wood paneling walls, booths and wagon wheel chandeliers decorate the interior of this dark restaurant. 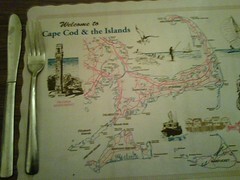 This photo is a picture of the place mat, an old 1950’s looking illustration of Cape Cod labeling the towns of the Cape. it also has little innocent icons of what people do here like “fishing, biking, boating, hiking, or lobsters! Of course I would love an updated Provincetown place mat listing all the activities one can do while in Provincetown. 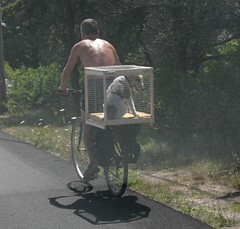 On our way to Truro Vineyards, we came across this homemade bike doggie carrier. The poor pooch was not exactly relaxed in this contraption. He was trying to gain his balance every few seconds. I guess for those owners who can’t stand to part with their dogs during a bike ride, this will help. I would not even consider it for Guffman since his 100lb body would take the bike down in no time. Sorry Guff – Daddy will continue to leave you at home for bike rides! You are currently browsing the archives for the Provincetown category.